Let's gun our engines. When you arrive on this deserted island, go a little right to reach the Clockwork Cantina. Click on the robot, and you will see a mini game, where you have to put the gears in the correct order. Put the larger ones on the top and bottom, making sure they mesh with the ones already there. Then make a straight path using the leftover smaller ones. Spin the handle and the gears will start spinning. Collect the Multi-Tool the robot drops behind. Now go right and collect the Steam Battery from the Garbage bin. Go back, climb the Cantina, and pull the lever on top to activate the long arm. Go over it, then hop off and use the steam blowers to get over the tall smokestack. Reach the glass dome from the other side, then use your Multi-Tool to open the hatch. Drop in. Keep going left, jumping over the obstacle and going down the hill. Jump on the right side of the lever to bring the other side up. Go a little left, and jump onto the blocks, going up. Reach the Steam Terminal marked #7, and go right. Jump onto the robot crab. It will flip over and drop a key. Collect both and then go back to the closed door of Sully's Paraphernalia. Use the Steam Battery with the key to open the door. What you have to do is somehow achieve the required pressure (on the right meter) from the starting pressure (on the left meter.) The "Total Change" at the bottom will tell when you're done. When you are, spin the dial. It's fairly easy to beat this -- pure adding & subtracting. The door will open. Go in and right. Ring the bell on the desk to wake up the robot there. He will start following you, but he won't answer any on your questions. Yet... go left and pick up the mallet from the junk pile. Leave the shop. Go into the garage at the right, past the obstacle, for the Mech, which is losing two parts. Leave this area and go left, past the big lever, and jump onto the steam blower. It will push you up to the top. Collect the old vine there, then drop off the roof. Go all the way right, past Main Street, into the Hub. Go right, and to the burning hot hatch. Sprocket looks like he could help... use the robot crab here. Sprocket will break it and dump the cold water on the hatch, cooling it off so you can go in. Drop down the ladder. Hey, Sprocket looks completely freaked out! Let's go without him, then. Go a little left, and you will see something move in the pipe! Go left, and onto the bridge. Drop down and go right, to find a HIDEOUS PLANT MONSTER!!! It will burst out of the pipes! Now, quickly, use the old vine to pull the pipe above down. The hot steam will engulf the monster, and you are saved! Sprocket will join you again. Go right, past where the monster was, and drop down. Run left, to find a "tilt puzzle." You have to tilt the maze to get the ball to the finish. Do this three times, and power will be restored to the elevator. Go back up and climb the Hub. Do this by using the pipe to the right of the hatch to climb to the platform above. Use the spring to jump onto the platform with the lever. Pull it, and the Hub will start turning. Drop off, then get back to the spring. Go right, and get onto the small platform to the right. You'll see the hub spinning above. Jump on the brown band, and use the vines to make your way left (switch from the vines like for the museum.) Reach the other small platform, and hop onto the Hub. It will take you upwards. Now, jump off onto the pipe on the right when it reaches. Use the steam blower to get onto the raised platform to the left. Reach the vine from there, and slide off to the left, HARD. You should land on a metal platform next to the elevator. Go up using it. Uh-oh. Sprocket will be attacked by plant tendrils! Click on him to go down, then shut the hatch covers closed to snap them. He will thank you. Wait... he talks! Ask him to describe Zack. You'll see a hologram of him, but you still don't know where everyone else went. Then go right, and use the moving platforms to reach the Captain's Quarters up there. Use the rotary dial to punch in the number from before -- 0516. You'll need to click early on the larger dials. Enter the secret passage that will open. This is creepy! I hope we don't get hit by any more freaks! You can also costumize with the picture of Captain Ziggs Sprocket shows you. Collect the Bridge Key on the left and the Weed Whacker Mech attachment directly above it. Is that Captain Zigg's dead body? Ohh... Leave the area, and run all the way right outside the Hub to the drawbidge. Use your Steam Battery here with the key you got just now. You know the drill. Cross the bridge once it opens. Hop up, activate next one. Make you way over the big barrier to the left using the platforms. Next switch, return to toasters. The left side lights should all be on now. All the lights should be on now. Press one switch, and ask Sprocket to press the other. Voila! The machinery above will start running. Return to the last switch you turned on. Remember how you got out of there? Do the same (jump up & right, and then left. Keep going until you see the panel.) Climb onto that one. You won't be able to stand on it until it completes the turn, though! Jump off to the right. Go right, jump up left, keep going and jump onto the next flipping panel for a brief moment before jumping off to the left, to reach the fat platform. Switch to the next one to the left, and then onto the long platform to reach a red lever. Pull it. The last fat panel you jumped on will start moving. Use it to jump off right. Keep going, then use the vine to get to the conveyor belt above. Sprocket will freak out, and you will soon find out why. Time yourself to avoid the falling bubbles, then reach the vine on the left. Switch between vines to reach the next belt. Don't worry; no monsters here. Just the Mech Steam Motor. Collect it, then use the vine to reach the next level. Sprocket will freak out again. Big surprise. Never mind for now, but we'll have to gear up for more monsters. Go left, and use the poster in the lab to make the Herbicide mixture. You'll have to use that dirty beaker from before. This is it: B-3, G-2, R-4. They need to be measured EXACTLY in the beaker. The color names are abbreviated. Leave the lab, and use the vine to reach the upper floor. There you will find another hideous mutant plant monster. Get close, and use the Herbicide to shrink the plant. The new pausing feature can help a ton. Enter the maintenance closet behind it, and collect the key. The alarm will be activated, and you cannot leave the way you came in. Quick, exit the closet and jump to the very top floor, the one with the dome. Run all the way left, and use the rubber mallet. The glass will smash letting you escape. Hooray! You're free. Run all the way left, to the Living Quarters. It's where you got the robot crab. You'll have to use the big lever again. Use the Steam Battery with the next key to open the area. Now follow the following instructions on how to find Zack(Sprocket's owner)'s room. Be sure to avoid the cracked platforms! hop over the gap and enter room 003, Zack's room. Hooray! You made it without getting lost, I hope. Sprocket will remember the room, and show you a costumizable hologram of Zack. Done drooling over it? Good. Go all the way left and climb up the vine. Drop off right, and if you keep going you'll find there's no way to reach the top floor. Yes, there is. Click on the pipes to play the steam pipe challenge, in which you have to remove panels and rearrange pipes to let the steam reach the end. But you have to do it before the steam catches up to you. When you're done a ladder will appear out of the ground. Use it to reach the top floor, and use that exit. From here, run left on the vine until you reach the next platform, with the Mech Crank. It's the final Mech Attachment. Drop down and run right until you reach Sully's Garage, beside the metal barrier. Run right and onto the crate. Jump up and walk a little left, to find the Mech. Use the Mech Steam Motor and Mech Crank to finish the Mech, which was originally started by Zack 200 years ago to escape the mutant plants. Now that it's complete, you can sit in it. You'll first collect the Mech Transporter, which will bring you back to your Mech in case you lose it. It is extensible, which means you can attach accessories to make it do even cooler stuff. They are aimed by your mouse and activate by the spacebar. 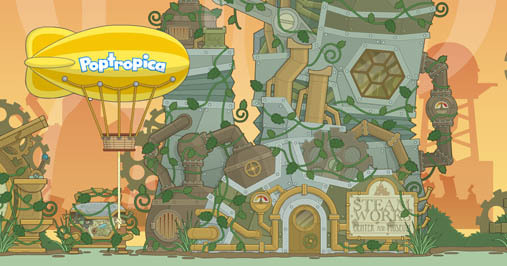 The Mech is by far the most awesome item ever in Poptropica! You can walk around using it, the jumping isn't great but I love it anyway. You have to get out to talk, but that won't be happening much on this island :). At first, though, the Mech is VERY hard to control. But you'll get the hang of it. Leave the garage and go all the way left, to the door with the plant branches around it. Attach the Weed Whacker, and whack away the branches in two quick hits. Then go in, to the Storage area. Whan Sprocket looks that way, you know trouble is ahead. Drop down and squash the plant attacker by whacking him. Go left and jump onto the giant springy plant. It will you up a floor. Leave the Mech and jump up to activate the elevators with the wheel. Jumping on an elevator turns it on. Take the elevator up and head right, destroying three more enemies. Take the next elevator and you will find another foe. It's throwing red fruit bombs that can knock you back. You can find out about the evolution of this plant monster in the Creator's Blog archives. Duck the bombs or use the Whacker. It's easier to duck, though. Keep going left this way. You can *CRUNCH* once you get close enough. Use the elevator and cross the gap on the moving platform a little to the right. Take the next elevator and head left. The next monster is too easy to beat; just splat it's tongue when you get close enough. Then, with no defenses, it will easily be destroyed with a simple whack. Exit this freakazoid mutant storage room through the hexagonal door. You are now in the Wind Zone, a calm, cool place, which you can tell just by looking at Sprocket's expression. Go left and whack the windmill blades. Sprocket will offer to help only if you stop them. Leave the Mech, go a little left, and use the vine to get onto the platform to the right (get off the vine.) Hop onto a windmill blade. It will carry you up. Jump off at the top and try to turn the gear. It won't budge, but I have a solution for that... use the Multi-Tool and it will turn, stopping the blades. After Sprocket has opened the door, get back in the Mech and enter the doorway. This is the Hibernation Center, where all the residents of Steamworks have gone to sleep to avoid the plant monsters. Go left and use the Multi-Tool to activate the machines and free the residents. Hooray! Sprocket finds Zack, finally after 200 years of painful waiting! Talk to the lady there with the gears for hairbands, the Mayor's wife. Wait... what's happening?! Uh-oh. The plants aren't gone yet! Run right really fast, shooting monsters. These are tough! TIP: if you fall all the way down, go left and use the screwy thing to get back up. This is tougher, though! When you're there, use the moving tractor platform to reach the other side. Go through the doorway to the right to start the final battle. Whoa! Here's the root of the problem... three evil plant monsters living below Steamworks. This part is supposed to bet tough, but no, it isn't really. What you gotta do is blast all three mutants three times each to bring peace to the island. They are very similar to the Hydra from Mythology. Get close to them, and they will attack. For the first one, get close and duck when he get ready to stick his head out. Then shoot after he does. Do this three times and he will be defeated. And did I mention the acid rising up? Run left and use the elevator to rise up and avoid the acid. Hop off right and keep going. Use the elevator and the next guy will be there, to the left. He's the same as the the previous one, but he shoots bombs at you which you should shoot down. This one's tougher 'cause he can push you back into the shaft. My trick is to keep shooting at the thingies he uses to shoot the pods. They fire in a set pattern. Done? Good. The hardest one is coming up! Hop onto the next tractor platform to go left. Don't worry; he won't come alive again. Jump off and use the other elevator and go right to find the big boss. Same story, but this guy has prickly bombs dropping from the ceiling on you! Back up when they fall. This one shoots his pod launchers simultaneously, so watch out! Whew! Finally, you've beaten every single one! You'll find yourself in the Hibernation Center and Mayor Crumb's wife will personally hand you that golden, shining island medallion to you, along with 100 credits. Buy yourself a nice costume. You'll need it after all that fighting with the plants!